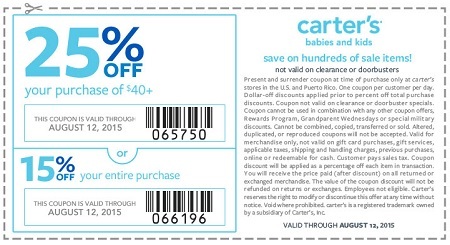 Last 2 days of great savings from carter's are ahead of us! Print a special sale coupon and save even more than usual. Take 25% off your purchase of $40 or more. Or, use a second part of the coupon and receive 15% discount on your entire purchase. Source of the information is carter's. More information about the sale available at U.S. carter's stores. Coupon must be printed to receive the offer. Valid through 08/12/2015.